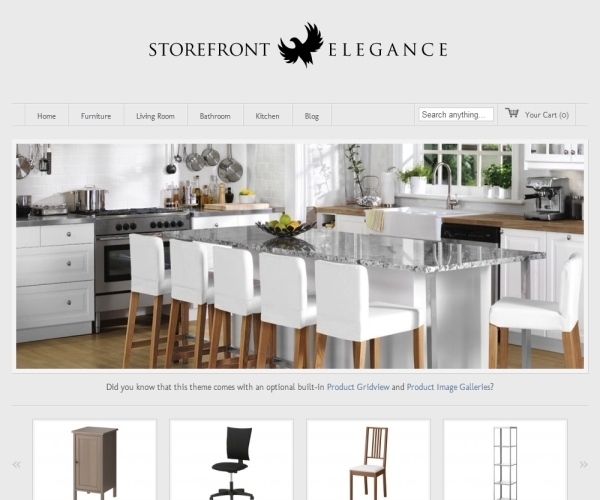 The Storefront Elegance theme is a beautiful theme which supports numerous features and functions. The easy to customize features will help the advanced level designers as well as beginners to create elegant websites. The option panel allows users to create designer websites using the custom fonts, custom colour options, and many more customizable features. The theme option panel gives users full control over logo, colour, site background, in-built page templates, custom menu integration, and much more. The homepage design comes with 16 different effects, all of which can be controlled using the theme options panel. The optional carousel can be utilized for displaying categories, products, blog posts, and custom post type. The fonts used in the theme can be easily customized so as to suit your website designing purpose. The theme comes with four different page templates namely the right side or default, 3 column, left sidebar and full width. These templates can be used for single product page, default blog page, default product page, and single blog page. The custom menu integration feature allows users to customize their menu as per the requirements of their blogs or website. They can change various attributes like colour, font, text, background, etc. of the menu. The homepage comes with numerous features which will make your website look more attractive and unique. Now you will be able to easily input Google Analytics code with a single button hit. This powerful and feature rich WordPress theme offers seven brand new slider effects. The thickbox effect is for all product galleries, images, and blog thumbnails. The newly offered product image gallery offers single product pages which will be automatically adjusted according to the single image size. The new product page comes with the grid view option. The single blog page and the default product page can be configured with the help of any of the four page templates which are offered by the theme. The blog integration feature is also supported by the theme with which you can create blogs and let your customers come closer to you. The single blog pages and the default blog pages can be configured with the help of any of the four page templates provided by this WordPress theme. The unified search feature allows for searching posts, products, and pages, all from a single place. The theme can be completely localized or translatable to various languages like Spanish, French, German, and so on. You can include the translation in the dashboard itself. For the new developer and website designers, the theme offers easy to customize features. Moreover, the all shop templates can also be included in theme folder to ease customization. The customizable features make it easy for the website creators to transform their website to blog according to their needs and requirement. Moreover, creating blogs and website is very simple and easy and requires no code usage. The website loading speed becomes slow at times when it has many images and data. The price of this theme is very high as compared to its other competitor themes. The theme also lacks the basic search engine optimization features. Further, the customer support system will sometimes take time in giving replies to your questions or answers to your queries. The theme cost is $59.